It's probably no surprise to anyone anymore that the strategy and techniques used by the President and this administration come from the Saul Alinsky book "Rules for Radicals" but few understand the goals that they're trying to achieve. Hopefully this will shed some light and understanding on what the President meant after several months in office when he said, "Things are going as planned" even tho in reality job loss rate was skyrocketing, the economy was nose diving and everything appeared very bleak and unstable. With the exception of Welfare and government positioning. We all remember the quote by Rahm Emanuel, “You never want a serious crisis to go to waste." That chain of thought is right out of the Rules for Radicals handbook. But the rest of the story is the fact that all of the chaos and crisis going on in America right now are created crises. While the rest of the country was struggling to hold on to their jobs and take care of their debts and responsibilities, right out the gate the President gave the welfare recipients a raise. More money, more food stamps. To understand the reasoning behind that you have to understand the Cloward-Previn Strategy. Strategy for forcing political change through orchestrated crisis. First proposed in 1966 and named after Columbia University sociologists Richard Andrew Cloward and Frances Fox Piven, the “Cloward-Piven Strategy” seeks to hasten the fall of capitalism by overloading the government bureaucracy with a flood of impossible demands, thus pushing society into crisis and economic collapse. Inspired by the August 1965 riots in the black district of Watts in Los Angeles (which erupted after police had used batons to subdue a black man suspected of drunk driving), Cloward and Piven published an article titled "The Weight of the Poor: A Strategy to End Poverty" in the May 2, 1966 issue of The Nation. 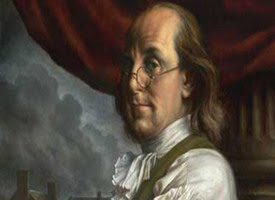 Following its publication, The Nation sold an unprecedented 30,000 reprints. Activists were abuzz over the so-called "crisis strategy" or "Cloward-Piven Strategy," as it came to be called. Many were eager to put it into effect. In their 1966 article, Cloward and Piven charged that the ruling classes used welfare to weaken the poor; that by providing a social safety net, the rich doused the fires of rebellion. Poor people can advance only when "the rest of society is afraid of them," Cloward told The New York Times on September 27, 1970. Rather than placating the poor with government hand-outs, wrote Cloward and Piven, activists should work to sabotage and destroy the welfare system; the collapse of the welfare state would ignite a political and financial crisis that would rock the nation; poor people would rise in revolt; only then would "the rest of society" accept their demands. The key to sparking this rebellion would be to expose the inadequacy of the welfare state. Cloward-Piven's early promoters cited radical organizer Saul Alinsky as their inspiration. "Make the enemy live up to their (sic) own book of rules," Alinsky wrote in his 1972 book Rules for Radicals. When pressed to honor every word of every law and statute, every Judaeo-Christian moral tenet, and every implicit promise of the liberal social contract, human agencies inevitably fall short. The system's failure to "live up" to its rule book can then be used to discredit it altogether, and to replace the capitalist "rule book" with a socialist one. The authors noted that the number of Americans subsisting on welfare -- about 8 million, at the time -- probably represented less than half the number who were technically eligible for full benefits. They proposed a "massive drive to recruit the poor onto the welfare rolls." Cloward and Piven calculated that persuading even a fraction of potential welfare recipients to demand their entitlements would bankrupt the system. The result, they predicted, would be "a profound financial and political crisis" that would unleash "powerful forces … for major economic reform at the national level." In October the President offered thousands of dollars to only 3,500 the poor in Detroit. You remember that, right? Obama money? Comes from Obama's stash? To quote a friend, "Why would BHO single out Detroit for a free handout to people to help pay their utility bills? They will be screaming they need help for next month's bills. If they hand out cash or credit cards, I am willing to bet very few utility bills will be paid with that money. More than a few of those there to get money said they voted for BHO because he said he would take care of them. This is the kind of society he is creating. All take and no give. It will be like the $2,000 handouts after Katrina. People were buying designer purses, etc. You can't make people responsible by giving them everything free. Many of those people have no idea where that money came from. They don't pay taxes and are thumbing their noses at those of us that do." And she had never heard of the Cloward-Previn Strategy, yet she defined the very goals/results of it in that comment. The Demoralized victims of more than fifty years of central planning and empty promises came together last week in Michigan. In a scene reminiscent of Soviet style bread lines, more than 65000 people filled out applications, hoping for a share of 15.2 million dollars appropriated by the Obama stimulus pkg to help low income families pay bills, stave off eviction or find temporary housing. Only 3500 people will actually receive aid from the program. This latest incarnation of the Obama recovery act only adds to the evidence that the stimulus was never about job creation, Instead it was merely a tool for the expansion of political power through the welfare state. 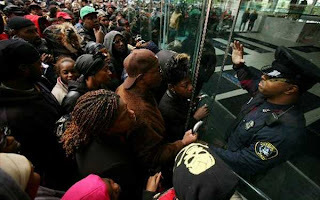 The long slow moving lines and ill-prepared city welfare workers agitated the desperate citizens who began to trample and fight one another for a shot at the limited number of applications. This is the end result of Obama’s redistributionist economic policy. Sold under the guise of compassion, social justice, economic justice, egalitarianism, the individual is reduced to a budget item, viewing his fellow man as a threat, competition for his slice of an ever shrinking communal pie. Redistributionist or socialist policy, call it what you will, can never produce the economic or social equality that those who champion it promise. In fact such a political and economic system only advances the creation of an inescapable binary class system they claim to oppose, the very rich and the very poor. It advocates the notion that the bureaucrat is more equal than equal. The bureaucrat in the welfare state is given the arbitrary authority over the validity of what he views as the needs of the citizen in relation to the immediate needs of the state. In the end redistributionist policy only advances the ultimate immorality, slavery, first by enslaving the producer to the non-producer, then through dependence of the non-producer to the state. And that's exactly what it is. 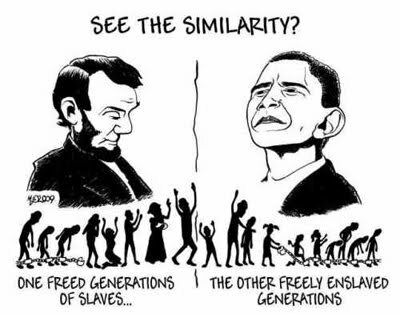 Slavery. This isn't a black issue, this is an American citizen issue. People are being bought for their vote. 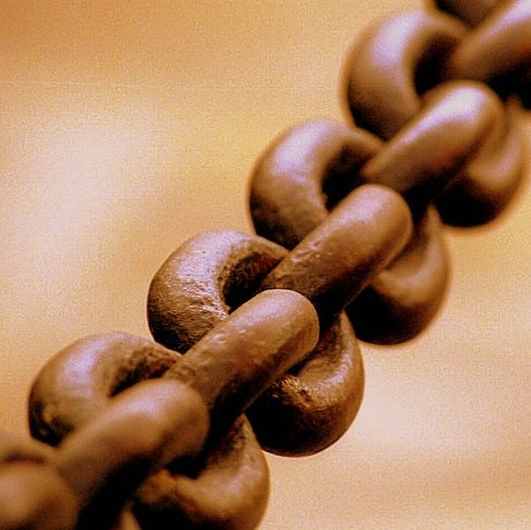 People are being enslaved to the welfare system and they don't understand or care about the consequences. They believe that government is going to support them. It doesn't matter where the money comes from, it doesn't matter that they have no desire or instinct to take care of themselves. What has lead to this mentality in a society that has been built on self reliance, pride in accomplishments, and determination to be the one to be responsible for one's own family? At what point did the welfare system become culturally correct? When did the welfare system change from a "safety net" to the entitlement programs of welfare checks, Section 8(a)housing, WIC, AFDC and looked at as being a good thing? Growing up, I knew of only one person I can recall who was on welfare, one of our neighbor's oldest daughters. She was a single mother of two children. When my family spoke of Sandra living on welfare, they would almost whisper that she was 'getting help' It was considered uncouth to speak of government assistance any other way. I remember watching Sandra getting off the bus, carrying sacks of groceries. I later found out that she was too embarrassed to use food stamps at the grocery store in our neighborhood, she would take the bus across town to buy her groceries. My own grandparents taught me about personal and financial responsibility, about respect and humility. They taught me the value of hard work, of providing for yourself and your family. To be a welfare recipient was an embarrassment in our community, and those who got it felt ashamed of themselves for needing it. Kevin Jackson is a 45 year old man. The Cloward-Previn Strategy was published in The Nation Magazine, May 2, 1966 issue. I'd like to encourage you to read the article about the Cloward-Previn Strategy in it's entirety at DiscoverTheNetworks.org, A Guide to the Political Left, to really understand the goals and intentions of the political left and why the comment, "Things are going as planned" makes perfect sense in a world of politics that appears to have just gone insane. Their strategy to create political, financial, and social chaos that would result in revolution blended Alinsky concepts with their more aggressive efforts at bringing about a change in U.S. government. To achieve their revolutionary change, Cloward and Piven sought to use a cadre of aggressive organizers assisted by friendly news media to force a re-distribution of the nation's wealth. Capitalizing on the racial unrest of the 1960s, Cloward and Piven saw the welfare system as their first target. They enlisted radical black activist George Wiley, who created the National Welfare Reform Organization (NWRO) to implement the strategy. Wiley hired militant foot soldiers to storm welfare offices around the country, violently demanding their "rights." According to a City Journal article by Sol Stern, welfare rolls increased from 4.3 million to 10.8 million by the mid-1970s as a result, and in New York City, where the strategy had been particularly successful, "one person was on the welfare rolls... for every two working in the city's private economy." The movement's impact on New York City was jolting: welfare caseloads, already climbing 12 percent a year in the early sixties, rose by 50 percent during Lindsay's first two years; spending doubled... The city had 150,000 welfare cases in 1960; a decade later it had 1.5 million. The vast expansion of welfare in New York City that came of the NWRO's Cloward-Piven tactics sent the city into bankruptcy in 1975. Rudy Giuliani cited Cloward and Piven by name as being responsible for "an effort at economic sabotage." He also credited Cloward-Piven with changing the cultural attitude toward welfare from that of a temporary expedient to a lifetime entitlement, an attitude which in-and-of-itself has caused perhaps the greatest damage of all. The next time you drive through one of the many blighted neighborhoods in our cities, or read of the astronomical crime, drug addiction, and out-of-wedlock birth rates, or consider the failed schools, strapped police and fire resources of every major city, remember Cloward and Piven's thrill that "...the drain on local resources persists indefinitely." This is another article worth reading in it's entirety at The American Thinker. Unsurprisingly, the low points come during the Democrat(ic) Kennedy, Carter, Clinton and Obama administrations. 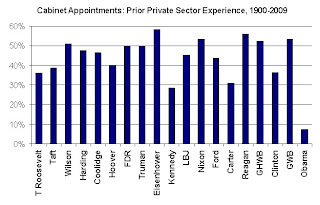 But the dearth of private sector experience in the Obama cabinet is almost breathtaking. 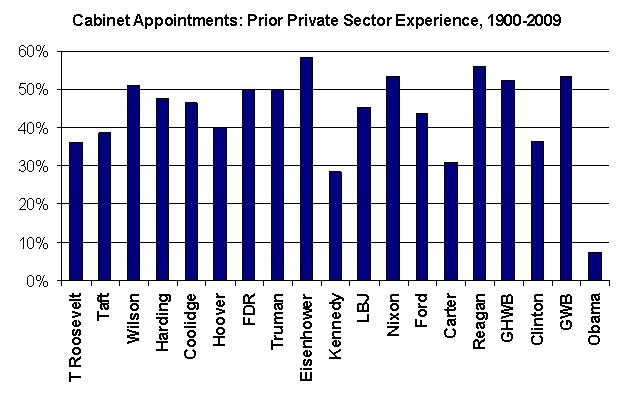 As Nick Schulz notes, “over 90 percent of its prior experience was in the public sector”. Wow. It shouldn’t be a “wow” moment, though. [This] administration is promoting exactly what we have suspected it would - elimination of private sector industry in favor of government control. From banking to automotive to health care to “net neutrality” - the government takeover is already well under way. 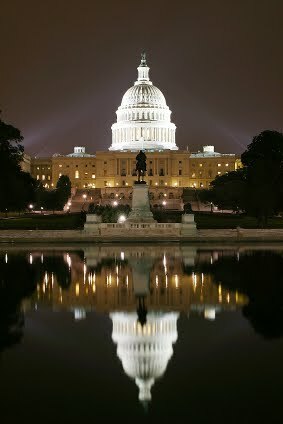 Americans: We are great without and in spite of the federal government. We are great because we've had the freedom to be great, and the government has interfered less than other governments in the world. We were great before Barack Obama, and we are now great in spite of him. Don't allow the devious, deceitful promises of security, no matter how well spoken, to be a substitute for the freedoms generations of our predecessors fought and died for. I am SO ready for 2010! The unveiling came during a news conference at the National Press Club here in the nation’s capital, but this was a lot more than a photo op. It was a demonstration of solidarity among more than 125 Christians of all denominational stripes that we will not only continue to speak out in the public square, we will continue to stand firm for biblical principles in that public square. And all I can add to this is IT'S ABOUT TIME!! 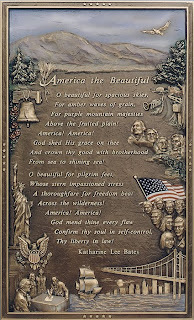 Between Oath Keepers and now The Manhattan Declaration I am encouraged as we move into 2010 and get busy rebuilding our party and getting our country safely back under the Constitution. 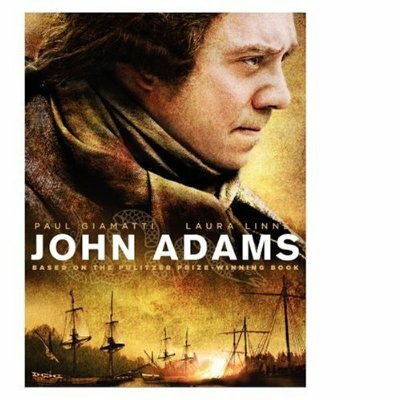 If you want to watch, first hand, the beginning of our Independence, the men and women who formed the foundations of the United State of America, this is the historic movie of all movies. It was an HBO series available on 3 dvd's now. The accuracy of the facts is 100% taken from the actual letters and papers of the John Adams family, Abigail Adams, Benjamin Franklin, Thomas Jefferson and more. On a scale of 1 to 10, I personally rate this a 26. 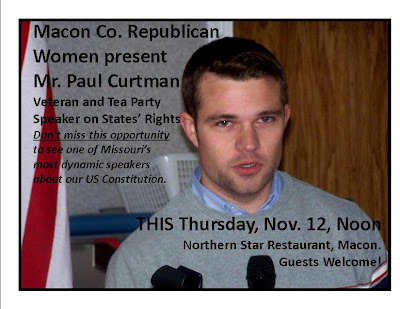 The Macon Co. Republican Central Committee will meet Thursday, November 12, 7 P.M., at the Courthouse in Macon. Featured guest speaker will be Mr. Lloyd Smith, the executive director of the Missouri Republican Party. Other items of discussion will include the local GOP's annual Lincoln Dinner Fundraiser, candidate recruitment, and the 2010 elections. All area Republicans are invited to attend. Sally Weber has created a very nice "fan page" for Macon Co. Patriots on Facebook. Click here for a link. Sally has been working hard to reorganize the Macon Co. Republican Club with the help of Jon Dwiggins, John Czuba and Donna Brem. I hope to be be able to announce their plans on Thursday night at the Macon Co. Central Committee Meeting. Our state party executive director, Lloyd Smith, will be the featured speaker that night. Bonnie Morris has just announced the speaker at the next Macon Co. Federated Republican Women's meeting with be Marine Sgt. Paul Curtman of St. Louis County. Mr. Curtman was featured on Fox News this summer for his comments at a Town Hall hosted by Sen. Claire McCaskill. Paul is one of the state's most dynamic speakers about our US Constitution and states' rights. He was a featured speaker at Saturday's Tea Party in Macon as well. The event will be held Thursday at Noon at the Northern Start Restaurant in Macon. Guests are welcome. John Putnam, Co-State director for the Missouri Fair Tax Law and an active participant in the Missouri Sovereignty Project. Each speaker encouraged attendees to be more engaged in the political process and to understand the US Constitution, including states’ rights. Guests were also encouraged to sign petitions for the Save Our Secret Ballot movement. Thank you to Dan and Melissa Bode for organizing this great event!